How To Invest In Shares And Win [2019 Stock Market Guide] | MF & Co. This is the ultimate guide on how you can learn to invest in shares in 2019. Investing is complex and making money in the stock market is not easy. However, did you know there is really only a few basic concepts you need to know that can help you make money from shares? One of the biggest mistakes investors make when they are learning how to invest in shares is to misunderstand the difference between low risk and a high-risk return. Too many investors report a compound annual growth rate (CAGR) return only but do not explain the risk metrics that are used to show how much risk the manager is taking to achieve that CAGR. This is especially prevalent during the good times. The extended market rally we’ve had invites complacency. Investors have been letting loose and borrowing money to leverage up their returns without considering the downside consequences or believing that the good times will continue to roll. Return metrics mean nothing without adjusting it for risk. As an example, the S&P500 has a long term CAGR of 9.62% since 1957. Now, if you wanted to “outperform” the market, all you have to do is buy the S&P500 on margin, gear it up by 1.5x and you would get a CAGR of 14.43%. Most would think you were a genius. If you look under the hood, all you’ve done is increased beta returns by 50% and increased the associated downside risk by 50%. 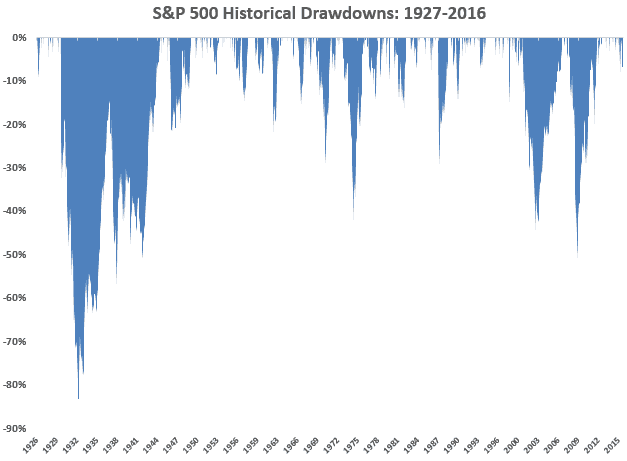 Below is a chart of all the drawdowns from 1927-2016. On average, major crashes will extend to a 50% drawdown (the great depression is a whole other story). If you were 1.5x geared into a crash and you weren’t actively managing or monitoring your investments, you would experience a 75% drawdown. This would effectively wipe the account. The single most stomach ulcer-inducing and wealth destroying risk metric to most people who are learning how to invest in shares, is quite simply how deep the drawdown your portfolio is. So how do we measure it? We like to use a comparison of the CAGR and maximum drawdown (MDD) as a measure. The ratio is used over certain periods to judge whether the investment is a good investment on a risk-adjusted basis. The measurement of this is called the MAR and CALMAR ratio. Both the ratios simply take the CAGR and divide it by the Maximum Drawdown. MAR uses Drawdown from inception, and CALMAR uses the last rolling 3 years, to get a better idea of the more recent performance. From this, we can see that the S&P500 has a MAR ratio of about 0.25 (9.62/50). The 1.5x geared portfolio also has a MAR ratio of 0.25, since you would have simply multiplied both the CAGR and the MDD by the same 1.5x. It would actually perform worse because trading on margin also requires funding. Adding gearing simply does not increase your risk-adjusted return, it linearly increases return along with risk. The index is actually a really poor risk-adjusted investment! A good investment has a MAR of 0.25 or better, essentially anything that beats the market on a risk-adjusted basis. However, be wary of investments with a high MAR ratio, especially as you are learning how to invest in shares. As risk and reward are related, anytime there is an overabundance of reward for what looks to be little risk, a large drawdown is most likely around the corner. Remember that we use the MAX drawdown, so a larger drawdown is always in the future, not in the past. So does it work the other way? Sadly the opposite is not true, an overabundance of risk doesn’t necessarily mean a big reward will come soon – it probably just means it’s a bad investment. So how do you boost returns and reduce risk? By actively managing your investments with a strategy as simple as stopping out of the market at 25%, you can double your risk-adjusted return as measured by the MAR ratio. If you can halve your maximum drawdown, you have doubled your risk-adjusted return. Additionally, applying mild leverage to your investments and using an appropriate stop loss strategy can easily help you get market-beating returns with the same or lower drawdown. Of course, things may not turn out the way you expect them to. If the drawdown happens to be 25% instead of 50% and you get stopped out right at the bottom of the trough, you will end up missing out on the upside in the recovery. There is of course, generally no free lunch so it does take a degree of skill and bravado to execute where other people are too scared to and this takes skill, patience and experience. Another downside of having such large drawdowns is time to recovery. The time to recover from a relatively small drawdown such as 20%, grows exponentially as you head past the 25% or so mark. Another important point is that if you draw down a large amount during a crash, you will almost certainly be working from a smaller amount of capital on the way back up. This will make it much harder to get the account back up to even. So how hard is it? The table below shows you what the recovery requirements are for each level of drawdown with an expected CAGR of 10% after the crash. As you can see, drawdown management is the number one risk you should be concerned with when learning how to invest in shares. If you used just 1.5x leverage on the index, you would take about 15 years before you are back to even. By that time, the next crash probably would have occurred already. From this table, you really don’t want to draw down more than 20-25%. Even if you didn’t use leverage, a 50% drawdown takes 7 years to recover, compared to a 20% drawdown which takes just 2.3 years. From history, we know 50% drawdowns are common, hence, passive investing in the index without active management of risk is a poor investment. If you can reduce your drawdown to just 25% while keeping your CAGR relatively the same, you will double the performance of the index. You will also take one third the time to recover to previous equity highs. Drawdown management is the single largest action you can take to protect their investments when learning how to invest in shares. All it takes is to not be lazy to significantly increase your risk-adjusted return. Even though the goal of active management is to beat the raw market CAGR, CAGR on its own really doesn’t tell much of a story. What you will find is that to significantly lower your MDD, you will generally lower your CAGR as well. However, once again we are interested in risk-adjusted returns as you can achieve higher returns by using leverage. As an example, if the market CAGR is 10% and the MDD is 50%, by managing your drawdown to 25%, you may reduce your CAGR to 8%. By applying 1.5x leverage, you will increase your MDD to 37.5% but your CAGR will increase to 12%. This is a 20% increase in CAGR and a 25% lower MDD. CAGR on its own is meaningless unless it is risk-adjusted. In a nutshell, beta returns are exactly what the market returns and alpha is the outperformance. As an example, if the S&P500 returned 10% in one year, the beta return is 10%. If you managed to make 12%, then the alpha return is 2%. The entire goal of learning how to invest in shares is to extract alpha from the market by beating the beta return. However, looking at returns without adjusting for risk is not useful. As an example, you can generate “alpha” returns by leveraging beta by 1.2x, and returning 12% versus the markets 10%. The problem with this is that any drawdowns will also increase by 20%. All you have done is geared beta returns without reducing the risk. Many investors got caught out in the GFC, mistaking geared beta for alpha and blowing up their accounts when they ran out of margin on their leveraged assets. Beta is cheap – alpha is not. If you want to just get beta returns, you can buy an Index Exchange Traded Fund (ETF) for next to nothing instead of learning how to invest in shares. However, since Beta returns are a poor risk-adjusted investment, you need to be able to stomach 50% drawdowns at least once every decade or so. If you actively managing what is essentially a diversified portfolio of stocks that don’t have a better risk-adjusted return than the market beta, you may be better off moving to a cheap ETF. Alpha is essentially market inefficiency. Alpha can only be generated when assets are over/underpriced and there is only a limited amount in the world. When Alpha is discovered it becomes arbitrated out and the Alpha will disappear as more and more market participants try to extract the same edge. This is why extracting Alpha has been much easier in the past. As more and more algorithms, ETF’s and professional market participants enter the market, the market becomes more efficient and opportunities disappear. Algorithms built to arbitrage out small inefficiencies in the market have exploded in the past decade and one of the main reasons why trading short term momentum has become extremely hard. Learning how to invest in shares is much harder than a few years ago and will only get harder. A good trader can generate alpha by producing better risk-adjusted returns, or alpha – but generating alpha is hard. It requires an edge, discipline and risk management as well as a strong understanding of the underlying market and market psychology to identify market inefficiencies consistently. Only by actively managing can you potentially generate a better risk-adjusted return. The risk and reward balance is generally pretty tight. Generating the same reward out of the same risk as the market is called beta returns. If you can generate a bit of extra reward out of the same amount of risk, you have an edge in the market, this is considered your alpha returns. Alpha returns come from active management and cannot be achieved via passive management. This is because a passive investment such as an index ETF will only track the market, which is 100% beta returns. In fact, ETF’s are built to be mediocre, as the fee component will cause the ETF to underperform every year with no chance of it ever outperforming the index. Passive investors settle for guaranteed mediocre returns. Learning how to invest in shares is already putting you at an advantage to those who are satisfied with beta or index returns. The best active traders have two distinct sets of skills. Generally speaking, a lot of traders may have skills in one area but not the other. As you are now just learning how to invest in shares, it’s good to have a good grasp of both before you build up any bad habits. A good active trader should have both an edge in the stock market and risk management in the right balance. Missing one of these skills or having an imbalance will lead to either anemic returns (lack of an edge, too much risk management) or erratic returns and big drawdowns (has an edge, doesn’t manage risk). Passive investing has its merits, especially for lazy and uninformed investors. However, you are here to learn how to invest in shares, you probably aren’t a part of this group. There certainly are a lot of lazy investors but when it comes to dealing with your financial future and your hard earned money, don’t you think your money deserves better attention than lazy investing? If you spent x amount of years saving your money, would it make sense to be lazy in looking after something you spent so much of your time to accrue? A little bit of education and a little bit of care can go a long way to helping you achieve a better financial future and how to make money from shares. When learning how to invest in shares, understanding the underlying market and how it functions is the first step to generating alpha. The market is not just a line on a chart, every tick that the price moves are a person or machine making a buying and selling decision with the single purpose of earning a profit. One of the most important things to remember is that size matters. Markets generally go through two modes, trending and consolidation. Trends happen when the market is searching for perceived fair value. Consolidation (mean reversion) happens markets have found perceived fair value and oscillates around an area called the value area. As everyone has a different opinion of what fair value of a stock is and the market is made up of thousands of participants, the fair value of a stock is never a specific price point – it is always an area. The only exception would be if there is a takeover offer at a specific price, then the exact fair value would be known and the stock should trade very closely or at exactly that price. It is very hard to figure out if the market is trending and turning into a consolidation – and vice versa. Trading a trend or consolidation is easy, but it’s the transitions between the two that gets most investors. Consolidation trading is dominated by algorithms and computers. As the market oscillates around fair value, algorithms will look to pick off areas of overbought and oversold and buy/sell the asset back to the mean. It is much harder to find an edge when fair value is known as there is less inefficiency hence less alpha during these times. However, consolidation trading is great for strategies such as index income strategies because you can make a bet that the market will stay between two points, rather than break out of it. As a consolidation trader, your job is to buy find stable stocks with a well known fair value. You will then trade the edges, which are the oversold/overbought levels around a consolidation. To find the edges, use a combination of support and resistance lines with indicators such as RSI and Stochastics to find levels of overbought and oversold. 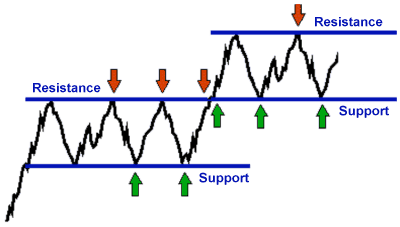 Essentially, sell the resistance and buy the support. Trend trading is much easier as markets trend when fair value is unknown. Imagine that a large buyer (or group of buyers) bought the stock at $50 in the belief that is mispriced and it should be worth $60 due to some sort of event such as a profit upgrade. Existing holders of the stock who also price their goods at $60 won’t be happy to sell it unless it’s at fair value – about $60. There is currently an imbalance of demand versus supply. Other investors also feel that the stock is underpriced and will continue to buy the stock. As long as there is no selling resistance, the market will continue to trend up as demand at a level below fair value will be higher than supply. Trading volume at these levels up to $60 will be low, as there would be a lack of suppliers below $60 if the majority of investors feel $60 is where the fair value should be. As the stock trends up and pushes into $60, investors will start to unload stock, balancing out the supply and demand equation. Once supply and demand are balanced and buyers and sellers transact at that level, the market will start to consolidate around that level. Your job is to look for momentum, where there is mispricing in the stock and joining in on the buying as the stock rises. To do this, look for stocks that break out of a resistance line on high volume and ride the trend until it consolidates. When learning how to invest in shares and timing entries, volume (size) is usually the missing ingredient in a lot of investors tool kits. From the above example, you can see that the start of a trend happens when investors feel the stock is mispriced due to some new information. This shift in sentiment can be seen in higher trade volumes as investors buy the stock at prices they feel is under fair value. During the trend, volume tends to be light since there is a lack of suppliers who are willing to sell below fair value. Therefore, any stock movements on low volume can be considered an advertisement of price. Buyers continue to purchase stock, looking for big sellers to sell to. Once the stock has reached a price where supply feels they can offload stock at fair value, buyers and sellers will interact and volume will spike. The stock will also stop trending as supply and demand balance out. Hence, high volume and consolidation is an indication of the end of a trend. When trading mean reversion, a lack of volume means a lack of participation or interest. Generally, when this happens, the stock will get bought/sold back down to its mean as investors perceive the stock to be overpriced or underpriced. It is very possible to catch some of the biggest stocks generating the most alpha without even looking at fundamentals. 80% of the market is made up of institutional investors with access to an immense amount of resources. You can assume if they decide to buy a stock en mass which triggers a trend, that they did it with rationality. Institutions have researchers, risk managers and lots of money and leverage at their disposal. If they buy, they are buying for a good reason. Institutional volume is hard to hide, if they are buying, you will see the volume spike to levels that are multiples of the average. Institutions spend a lot of time and money trying to hide their tracks, but the fact is, traded volume is impossible to hide. By watching for these volume and price spikes, you can hitch a ride with the investors and drastically increase the probability you pick the next Apple. Hence, event-driven strategies have the highest probability of generating consistent alpha as it produces the largest mispricing and stirs the strongest market reactions. The market is just one giant auction driven by fear and greed and the supply and demand imbalance. Institutional volume moving into and out of a stock en masse will disrupt this imbalance causing stocks to trend. Understanding this is the key to finding and staying in trends. Alpha comes from mispricing of fair value. This means the harder to value a firm’s fair value, the higher the probability of mispricing and the more alpha can be generated if you can identify areas of oversold and overbought. However, with more uncertainty of fair value comes more risk, managing the downside risk is an important consideration when picking these type of stocks. There are hundreds and thousands of stocks across the world, which means the potential for mispricing a stock is much higher than an index or commodity. Stocks also tend to trend more because there is less “wisdom of the crowd”. In addition, indices are made up of hundreds of stocks which could be going up or down at any one time. This causes the index to be less volatile. Indices and commodities are dominated by algorithms that try to arbitrage out all the small volatile movements. Indices are also generally pretty efficient and commodities are driven by supply and demand we have no control over. As an example, OPEC can come out tomorrow and tell everyone they are doubling production. The oil price will be crushed and nobody can predict this. There may be no rationale except for politics behind the decision. So how can we make use of indices? Indices are actually great for other types of strategies such as options premium selling for income. This is because an index tends to consolidate, which means they trend a lot less and makes income type strategies more predictable. Options income strategies and trading mean reversion is actually one of our staple strategies that 80% of our clients use. If you are looking for momentum, stocks such as utilities, financials, industrials and real estate investment trusts are generally unfavoured. These stocks are easier to price as they have predictable revenue streams and generally don’t innovate much and stick to the status quo. These stocks generally consolidate or trade back and forth between perceived fair value. Resources are out too since their revenue stream is highly correlated to commodity prices. If you have an edge predicting commodity prices, it may be smarter to just trade the underlying commodities as it removes the unsystematic risk from holding the companies which extract the resource. 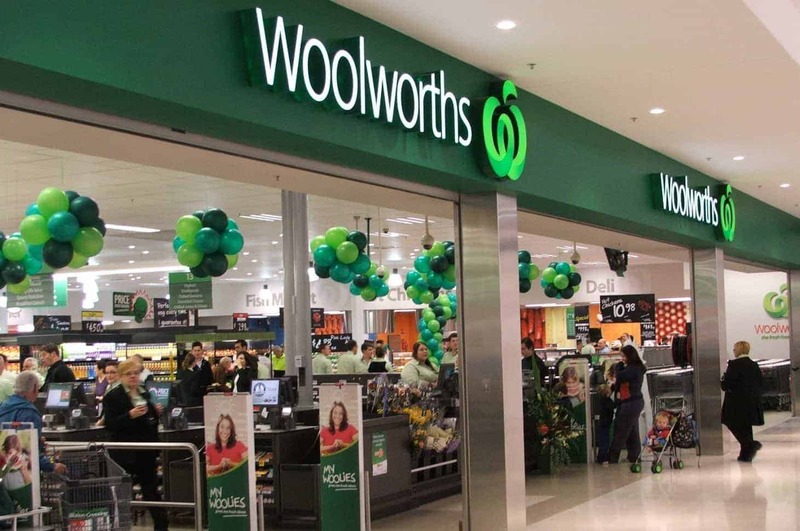 Woolworths (ASX WOW) is a low momentum stock good for consolidation trading. Stocks with low momentum are favoured for mean reversion trading and is much harder. For momentum, you want to look in sectors which innovate. Sectors such as technology and healthcare have been strong outperformers as the world becomes more digitised and the world becomes more efficient. These type of companies tend to have a high risk to reward ratio in their business models. Disruption, innovation, development of new drugs, procedures and equipment all have a high level of uncertainty with massive rewards for the companies who succeed. A2 Milk (ASX A2M) is a high momentum stock great for trend trading. Stocks with high momentum are perfect for trend trading. Momentum trading is what most investors use when they are learning how to make money from shares. There is a fine balance between having enough diversification to reduce unsystematic risk (single stock shocks such has profit downgrades) and the effect diversification has on alpha generation. So what is considered too much? To asses how much of your returns is purely due to beta, you can check the correlation coefficient of your returns against a benchmark like the ASX200 or the S&P500. A low beta of less than 0.3 is preferred, as that means only 30% of the returns is attributed to beta. It is hard to have 0 correlation if dealing in stocks. To achieve anywhere close to 0, you would have to trade a basket of uncorrelated assets (Futures, FX, Commodities, Long/Short). If you are learning how to invest in shares only, there will always be some correlation to an index since the index is made up of the stocks that your portfolio are invested in. Hence, the more you diversify, the more of the index you own and the more correlated you become. If you find that the monthly returns you are getting have a very high correlation to the benchmark such as above 0.8, that means a lot of your return comes from just regular market movement and you are not gaining alpha returns. Let’s take the S&P500 index as an example. Let’s assume that in the next year, the return for the S&P500 index will be 4%. This is the average return of all 500 stocks. At the end of the year, let’s assume there were 5 stocks that returned 50%, 10 stocks that returned 25% 20 stocks returned 10% and 30 stocks lost in excess of 10%. A trader’s edge comes from identifying the stocks that have outperformed, avoiding the stocks that have performed average and taking special care to avoid the big losers by cutting losers short. It is not necessary to pick all of the outperformers, what matters is the ratio of outperformers you have picked versus the average stocks that didn’t outperform the market. However, taking too many trades, diversifying too much and not being precise with your analysis will dilute your returns. Let’s assume you identified 19 trades out of the 500 and at the end of the year. You picked 1 stock returning 50%, 1 stock returning 25%, 5 stocks returning 10% and 12 stocks once averaged returning the market beta of 4% and didn’t outperform. There were no large losers because you have been managing your risk and cutting his losses short by using a stop loss. By taking those trades, you have achieved a return of 8.65%, an excess return of 4.65% above the market beta return of 4%. The 4.65% is your edge, the alpha return. The ratio of outperforming stocks in the portfolio is 0.36, whilst the ratio of the outperforming stocks on the S&P500 is just 0.13. By having more of the outperformers in the portfolio, you are able to generate alpha by filtering out the non-performers. You need to have an edge. An edge is a methodology that you follow to filter out the non-performers. This can be qualitative and/or quantitative. You need to be picky. If you pick 40 trades instead of 19 because the other 21 looked “good enough”, the return will average out to be just 6.325%. Diversification and turnover dilute outperforming trades. It is vital that you don’t trade just for trading’s sake. There generally aren’t that many outperformers in any one year. Making the mistake of thinking you can pick every one of them leads to overtrading and diluting the outperformance. You only really need to pick a few outperformers to achieve alpha and outperform the market. The trick to finding more alpha is to go to other markets and look there. This is why having the ability to trade multiple markets across multiple countries gives flexible traders a much larger range of alpha to extract. We have a strong focus in the Australian market but we also have a night desk and have Advisers who trade the US market for alpha. The final important point is that you need to take have conviction. If you only take some and not all of the trades you identify as good, there is a good chance the one you didn’t take is the 50% outperformer that will give you your alpha return. Diversification is still important to reduce unsystematic risk. However, great care needs to be taken to ensure that not too much is used that it diminishes your ability to produce alpha. Finding the right balance between holding too many positions and not enough to reduce risk, is the key. You need to have an edge. If you are is just throwing darts at a dartboard, you are better off diversifying and shifting most of the returns to beta or get professional help. Alpha generation is hard because if you are reducing the number of investments from 500 to 20, there is a pretty good chance that the majority of the outperformers end up in the 480 you didn’t pick. As an example, if the ratio of outperformers to average is 0.17, without an edge, the ratio remains the same if you pick 20 out of the 500 stocks. 0.17 out of 20 is 3.4, which means the winners just aren’t large enough to generate above average returns. If you increased your ratio to 0.3 through an edge, you now have a probability of picking 6 outperformers out of 20, which can give you outperformance and alpha generation. Investors looking to learn how to invest in shares often approach alpha generation in the wrong way. Outperforming stocks are the exception, not the rule. As an example, if only 10% of the stocks are outperformers, you are fighting probability. It is much easier to filter out the poor trades that consist of the other 90% of the index. The idea is to cut the losers and average trades so you increase the ratio of outperformers versus non-performers. So how do you apply a filter? Doing something as simple as filtering stocks out which have falling P/E momentum will already give you a slight edge. Slow earnings are a good indication of a stock which is not expected to outperform in the future. There are numerous ways to filter out bad trades or bad stocks. 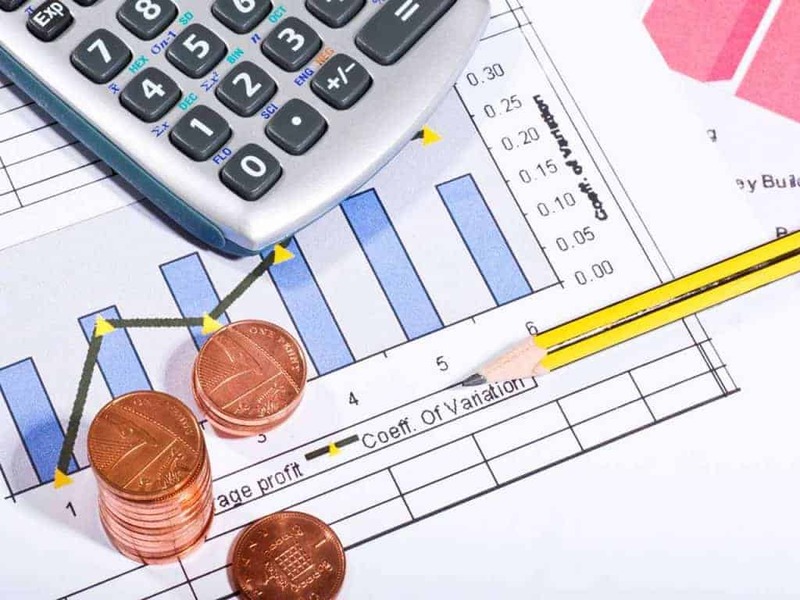 For someone who is just learning how to invest in shares, stick to some of the more well-known metrics such as looking at financial ratios and simple technical indicators like RSI or moving averages. For financial ratios, these are harder to get – we actually offer over 50 ratios for all ASX 300 stocks with our free stock profiles. We have this as a free resource to help out new investors who are just learning how to invest in shares. Picking non-performers is unavoidable, there are too many factors in the market that can’t be predicted. We can’t tell you when the next Global Financial Crisis will happen, the only thing we are sure of is that it will happen. The markets are littered with the bodies of expert commentators who have called the next GFC year after year and were wrong. It is not that their logic isn’t sound, it is that the markets can stay irrational longer than you or your reputation (or bank account) can stay solvent. The only thing you really can do is to prepare. Just like insurance, you hope you never need to use it but you would be a fool not to have it. Being prepared means you can sleep soundly at night and know that you would have something left after the crash (and other subsequent crashes after that). The best you can do for your financial future is to manage the downside so you go through the crash with a bruise rather than going bankrupt. Remember that managing drawdown is the most important factor, time to recover from a drawdown increases exponentially as your drawdown increases linearly. By going down the active route, actively managing your portfolio and making smart decisions – you are already preparing for the next crash. Debt to GDP ratio is as high as 2008 again and debt is still growing at an uncontrolled rate. 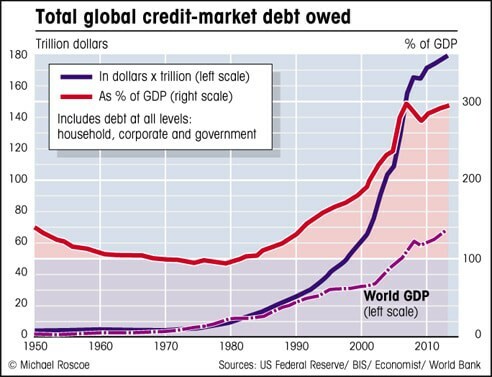 However, world interest rates are still suppressed and governments hold a huge amount of debt. There is no interest rate lever to pull this time and no government to bail out institutions that are even bigger than in 2008. Make sure you are prepared – beta returns will get completely decimated when the market crash again. If you are just learning how to invest in shares, use active management – don’t get drawn into passive funds. Good Financial Planners have your best interest at heart, but they are planners, not investors. Your Financial Planner is remunerated to achieve long term goals via a holistic view using asset allocation and insurance strategies. Their focus is not to produce alpha returns from the market. Financial Planners understand the drawdown risk of all the assets that they recommend and balance each one to fit your personal risk tolerance by using a mix of those assets. Their adjustment to risk is linear, so there is no edge in what they do. There is no edge in going up or down the risk to reward curve. As an example, by putting half your money into a bond, your equity drawdown will halve but so will your equity CAGR. All that has happened is that your exposure has been halved. Active investors are moving up the graph, not diagonally. As stock market traders and investors, we are looking for more return for the same amount of risk. Financial Planners, don’t do this. Financial Planners tend to want to get beta returns, since investing in active management will lead to questions if active management doesn’t perform. However, if it is beta only, then they can attribute this to the market and say it has nothing to do with them. There is no need for responsibility. Active management also generally have shorter historical statistics will throw off their risk models, placing unnecessary risk on their portfolio construction and recommendations. So should you use them? There is definitely nothing wrong with what your financial planner recommend as long as it is in your best interest. However, as you now know, beta returns are a poor risk-adjusted investment, so there is definitely room for improvement via active management to improve the equity portion of your portfolio. Incidentally, not all Financial Planners think the same. A lot of clients do like to have direct share ownership, so we work with a number of financial planners to fill this niche. We do this by splitting off the equity portion of the portfolio and our Advisers can generate alpha returns on the equity part of the portfolio. Don’t leave your financial future to the whims of the market by being a lazy investor. By not searching for a better risk-adjusted return, you are potentially opening up yourself to higher risks than what you really need to. We have spoken to many investors who have not touched the markets since 2008. They have subsequently missed out on the massive rally that would have made back all their money and then some. Even though you will cop some pain when markets fall, stayed invested to participate in the upside. Growth rates don’t have to be spectacular, they only need to be less volatile. The most volatile metric known to man is the drawdown and it is the one metric that you have to manage. As you become a better trader, you will start to manage your risk better and achieve a better risk-adjusted return. This is how you make money from shares. Always remember that there is a balance between having an edge and generating alpha versus risk management. A quality investor should have a good balance of both and not be afraid to pull the trigger, even when the markets look scary. Don’t fall for the beta return trap. Check the correlation of your returns to ensure that you are not just gearing beta to for outperformance. The inevitable outcome is that a big drawdown will come and you will receive a margin call. The next crash will be an epic. Interest rates are at historic lows, debt is at all-time highs and the governments are out of ammo. Be prepared by managing your risk and be one of the smart investors. You need to be the first one out the door when it all comes apart and the first one in when the market bottoms. A good investor who constantly monitors the market and has good risk management practices in place. This will be the difference between a small drawdown and quick recovery to a big drawdown and long recovery. Financial Planners are great as long as they have your best interest at heart, however, they are not investors. If you want outperformance on a risk-adjusted basis from your equity portfolio but this all seems too daunting, you will need to find a specialist Adviser who can assist. ASX300 Stock Profiles – Get free financial ratios and industry comparisons for instant quantitative and fundamental checks on a stock you’re looking to buy.